Paris: A man whose body rejected a face transplant he received seven years ago has been given a second donor face after living nearly two months without one, French medical agencies said Friday. It is the first time in transplant history that doctors have replaced one donor face with another, according to Olivier Bastien of France’s biomedicine agency. A transplant can help recipients — often victims of accidents, violence, or rare genetic disorders — to resume basic tasks such as breathing, eating and speaking, and restores non-verbal communication through smiles and frowns. But it also means a life-long reliance on immunosuppressant medicines, to stop the body rejecting the “foreign” organ. These drugs can leave a person vulnerable to infections and cancers. It is a rare procedure with fewer than 40 operations performed to date, and at least six patients have died. The latest recipient, in his 40s, went under the knife at a Paris hospital on Monday, for a procedure that lasted nearly a full day, according to a joint press statement issued by the biomedicine agency and the AP-HP public hospital system. The man’s original graft had been removed in an operation on November 30, and he was kept on life support in an induced coma until the follow-up procedure. “This graft shows for the first time… that re-transplantation is possible in the case of chronic rejection” of a donor face, said the statement. It will be weeks before doctors can say whether the second graft has taken. 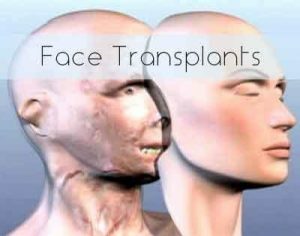 The recipient of the world’s first face transplant, Isabelle Dinoire, died of cancer in April 2016, 11 years after her groundbreaking operation. Doctors said her body had rejected the transplant, and she had lost partial use of her lips by the time she died.